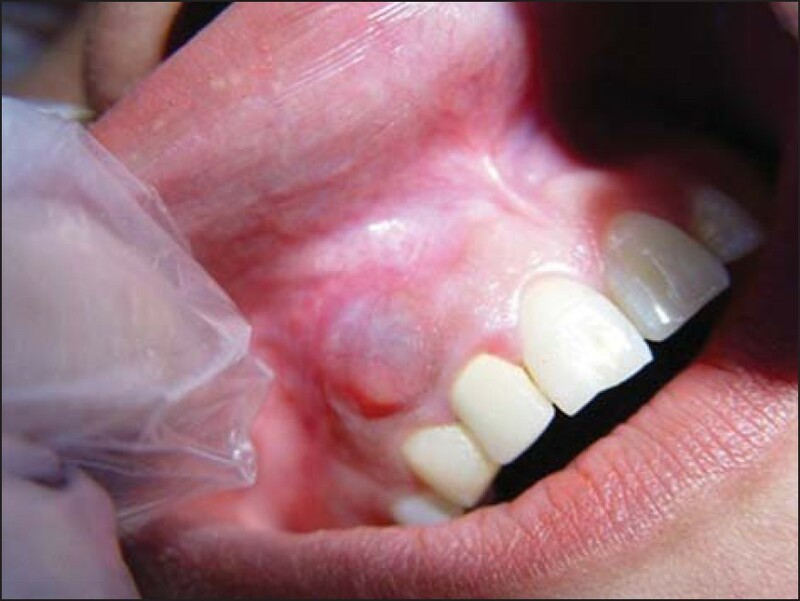 Keratocyst odonogenic tumor (Kcot) is one of the most prevalent lesions in the oral cavity recently named as a tumor due to its aggressive behavior and growth pattern, which is seen in the mandibular jaw especially in the posterior regions. One of the most important characteristics of this tumor is wide extension in the lack of distinctive clinical expansion. However, some rare Kcot cases with unusual location and clinical behavior have been reported. The present article that is a case of Kcot with distinctive expansion in the anterior region of maxilla among them. 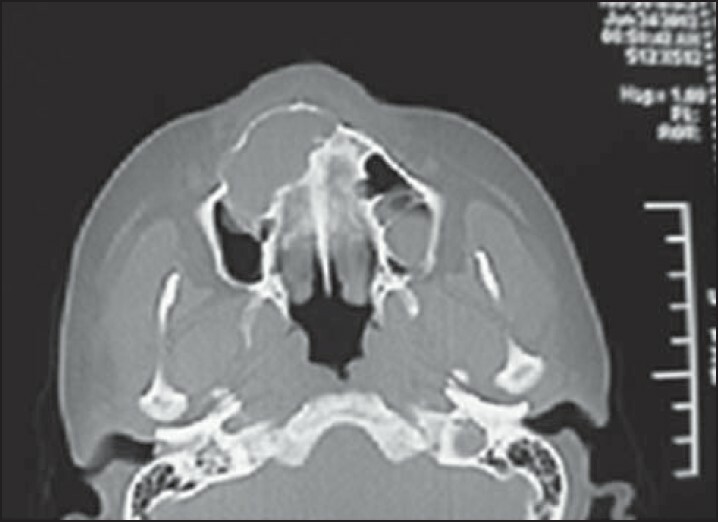 A 26-year-old female with a chief complaint of swelling in the right side of maxilla initiated from 1 year ago was referred to the clinic. Clinical examinations revealed a fluctuant swelling without any tenderness in the apical region of teeth number 12, 13 and 14. A well-defined uni-cystic radiolucency with sclerotic borders from the distal of the tooth number16 to the distal of the tooth number 22 resulted in root displacement of teeth 12 and 13 was seen in panoramic radiography and computed tomography scan. Superior displacement of the inferior border of the right maxillary sinus and the nasal cavity floor was also seen. Finally, with performing excisional biopsy, histopathological diagnosis was as Kcot. Due to the different clinical and radiographic manifestations of Kcot, it is necessary to complete evaluation of cyst-like lesions in unusual locations with uncommon clinical characteristics. 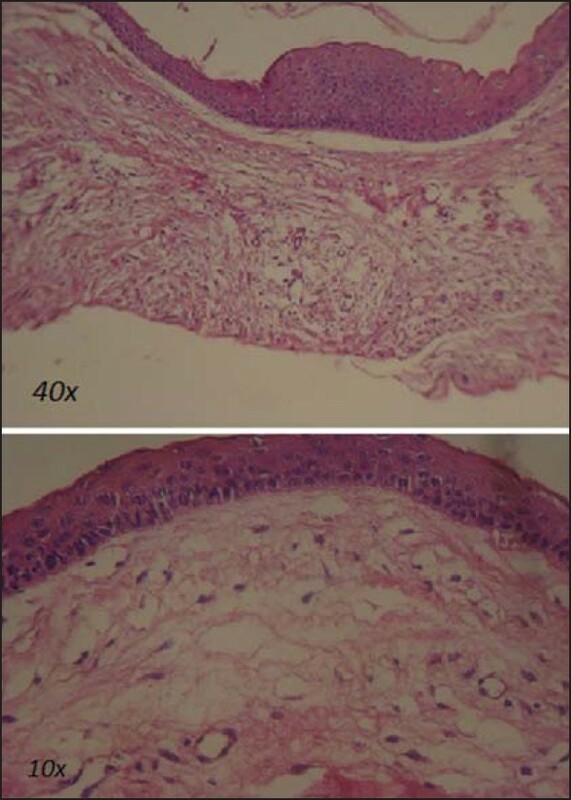 Kcot typical histologic features include a layer of epithelium with little evidence of rete ridges and a corrugated, keratinizing luminal surface that is primarily parakeratinized. The present study describes, a clinically significant case of Kcot cosidering the location and expansile behavior in the anterior of maxilla. A 26-year-old female with 1 year swelling in the right maxilla that rapidly grew during 2 previous months was referred to the Department of Oral Medicine in Isfahan University of Medical Sciences' Dental School. Intraoral examination revealed a 1 cm × 1 cm nodular expansion in the gingival portion of tooth number 12 with a dark pink purpled lines and loosed consistency lesion. Tooth 12 was endodonticaly treated and had a prosthetic crown. Teeth number 11, 13 and 14 had no carious and periodontal problems showing normal response to the vitality tests [Figure 1]. 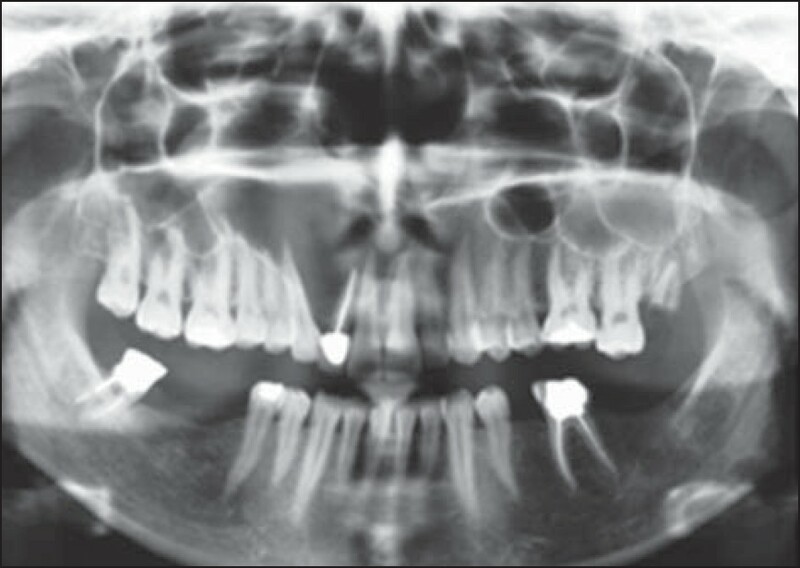 In the panoramic view, large unicystic radiolucency with sclerotic borders was observed from the distal side of tooth 16 to the same side of tooth 22. In the interspace area between teeth 12 and 13, the lesion was completely extended to the alveolar ridge causing severe divergency of teeth 12 and 13. It was seen also the upper displacement of the right maxillary sinus floor and medial displacement of the nasal cavity floor and lateral wall [Figure 2]. Intraoral periapical radiographs also revealed a radiolucent lesion with sclerotic borders from the distal of tooth 16 to the distal of tooth 22 without any evidence of internal septas. 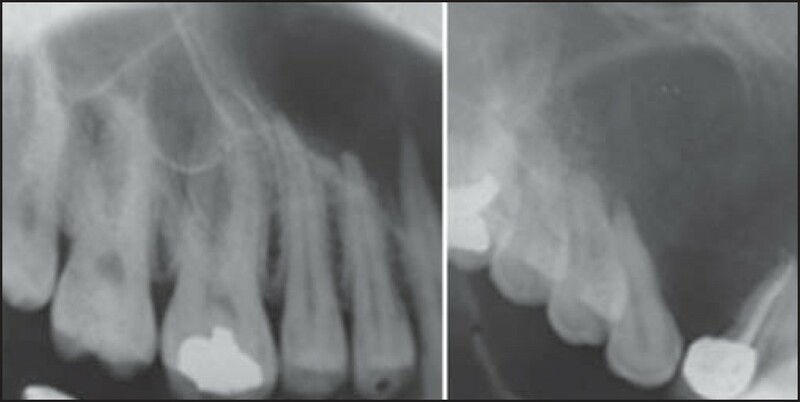 Root displacement of teeth 12 and 13 is quite evident, but there was no evidence of root resorption [Figure 3]. Computed tomography revealed a radiolucent lesion in the right side of maxilla with cortical borders and extension to the maxilla midline [Figure 4]. In the axial view, lesion caused to superior displacement of the right maxillary sinus anterior wall and medial displacement of the nasal cavity floor and lateral wall [Figure 5]. The patient was referred to the oral and maxillofacial surgery department performing excisional biopsy and curettage with preservation of all teeth in the region of lesion. Histopathologic examinations showed a uniform epithelial layer with less rete ridge or without. The luminal cells were keratinized or parakeratinized and the satellite or daughter cysts was seen in the connected wall [Figure 6]. Kcot is one of the most common jaw tumors that is more occured in the second and the third decades of life. The presented patient is also in this range of age. Regarding the number of previous studies, most cases have been reported in men,  but present case was not. Most of the reported cases were involved the mandible, especially in posterior areas,  but the presented case was in the anterior region of the maxilla. One of the most diagnostic characteristics of Kcot lesion is the extension through the bone much more than the bone expansion, thus until the tumor does not reach to significant dimensions, expansion is less important. In the presented case, expansion is in consistent with extension and was more significant than the past reported cases. , In the presented case considering the location and radiographic appearance, lateral periodontal cyst was one of the most important differential diagnosis. Special treatment considerations are needed to classification of Kcot as a tumor. Loose coupling of epithelium and underlying connective tissue, epithelium proliferative activity, increased expression of proliferation indexes (ki-67 and anti-apoptotic bcl,  the presence of epithelial connective tissue buds and fragile cyst wall may be the reasons for special behavior of the tumor. Despite the aggressive behavior and simulating pattern that can mimic the vascular lesions, periapical cysts, periodontal lesions and reactive lesions like central giant cell granuloma  it is important to diagnose the less usual locations with non-classic behaviors. The treatment options include enucleation, curettage, marsupialization, decompression, carnoy solution and completely resection considering the patient's general health status, age and the degree of cooperation. ,, In the presented case, excisional biopsy, curettage and periodical follow-up was prescribed. 1. Godhi SS, Kukreja P. Keratocystic odontogenic tumor: A review. J Maxillofac Oral Surg 2009;8:127-31. 2. Maurette PE, Jorge J, de Moraes M. Conservative treatment protocol of odontogenic keratocyst: A preliminary study. J Oral Maxillofac Surg 2006;64:379-83. 3. White SC, Pharoah MJ. Cysts and cyst like lesions of the jaws. In: White SC, editor. Text Book of Oral Radiology. 6 th ed. St. Louis: Mosby Elsevier; 2009. p. 506-12. 4. Kolokythas A, Fernandes RP, Pazoki A, Ord RA. Odontogenic keratocyst: To decompress or not to decompress? A comparative study of decompression and enucleation versus resection/peripheral ostectomy. J Oral Maxillofac Surg 2007;65:640-4. 5. Naveen F, Tippu SR, Girish K, Kalra M, Desai V. Maxillary keratocystic odontogenic tumor with calcifications: A review and case report. J Oral Maxillofac Pathol 2011;15:295-8. 6. Açikgöz A, Uzun-Bulut E, Özden B, Gündüz K. Prevalence and distribution of odontogenic and nonodontogenic cysts in a Turkish population. Med Oral Patol Oral Cir Bucal 2012;17:e108-15. 7. González-Alva P, Tanaka A, Oku Y, Yoshizawa D, Itoh S, Sakashita H, et al. Keratocystic odontogenic tumor: A retrospective study of 183 cases. J Oral Sci 2008;50:205-12. 8. Stoelinga PJ. The treatment of odontogenic keratocysts by excision of the overlying, attached mucosa, enucleation, and treatment of the bony defect with carnoy solution. J Oral Maxillofac Surg 2005;63:1662-6. 9. Pogrel MA. Treatment of keratocysts: The case for decompression and marsupialization. J Oral Maxillofac Surg 2005;63:1667-73.